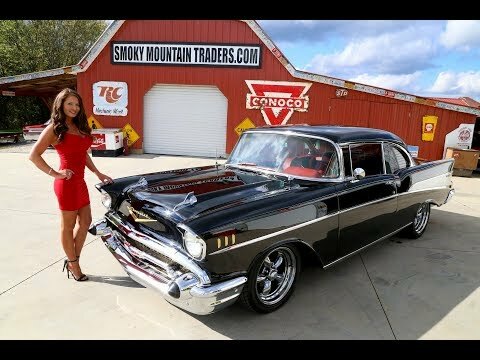 Up for sale we have a 1957 Chevrolet Bel Air two door hard top. This car has undergone a gorgeous frame off restoration and has had some great upgrades done as well. This iconic body style is set off by some of the best body lines ever designed by Chevy. As you can see with this car all the lines, gaps, and panel fit are some of the best you will see on a '57. The body is straight as an arrow and is covered in the Onyx Black paint scheme that has been buffed and polished to a deep shine that's slick as a ribbon. Another thing that made this body style so iconic was the Chrome and Stainless package. This car is a factory V8 Bel Air so it adorns all the correct trim which appears to have been replaced at the time of the resto. Also, all the chrome is like new from bumper to bumper. The glass has also been replaced with the Smoked side and rear glass. To finish off the look it's sitting on a set of 17” and 18” American racing Wheels that show off the disc brakes. Next, we will look at the interior of this '57. On the inside it features the factory style Black and Red color combination that provides the perfect complement to the exterior. The seat covers, and door panels are in excellent condition and feature the two-tone style. As for the carpet and headliner they are both done in red. All the stainless accents on the interior are also in excellent condition from the headliner trim to the dash trim. Looking at the dash you can see the paint is slick and that it features a Tilt Column and has been upgraded with a Digital Radio along with Vintage Air AC and Heat installed. Also, all the gauges are working as they should. In the trunk you can see that all the weather stripping is in great condition and that everything appears to be rock solid! Finally, we will get to the heartbeat of this Chevrolet. Under the hood it features a 350 engine that has been upgraded with the Front Runner serpentine belt system and that it's dressed in the Polished Valve Covers and Breather. You'll also notice that all the inner fenders and firewall are in great condition and painted Black. To go along with the AC upgrade, it also has Power Steering to go along with Power Brakes that feature Disc on all Four Corners. To keep it cool it has the Aluminum Radiator with the electric fan. When you look under it you can see that they did an gorgeous job with the Frame Off Restoration. All of the frame and floors appear to be original and rock solid. New body bushings were installed at the time of the restoration and you can see that the Gas tank was replaced along with the fuel and brake lines. Under the front it has been upgraded with Tubular Control arms along with new bushings and ball joints. The 350 Engine is mated to the 700R Trans and the 10 Bolt Rear End. For exhaust it has headers with the dual pipes and the turbo style mufflers.